Physicists resolved a decades-long mystery by describing how quickly a particle can pass through a barrier. At the subatomic level, particles can fly through seemingly impassable barriers like ghosts. Particles can pass through solid objects not because they're very small (though they are), but because the rules of physics are different at the quantum level. Imagine a ball rolling down a valley toward a slope as tall as Mount Everest; without a boost from a jetpack, the ball would never have enough energy to clear the hill. But a subatomic particle doesn't need to go over the hill to get to the other side. Particles are also waves, which extend infinitely in space. According to the so-called wave equation, this means that a particle may be found in any position on the wave. Now picture the wave striking a barrier; it continues on through but loses energy, and its amplitude (the height of the peak) dips way down. But if the obstacle is thin enough, the wave's amplitude doesn't decay down to zero. As long as there's still some energy left in the flattened wave, there's some chance — albeit a small one — that a particle may fly through the hill and out the other side. Conducting experiments that captured this elusive activity at the quantum level was "very challenging" to say the least, study co-author Robert Sang, an experimental quantum physicist and a professor at Griffith University in Australia, told Live Science in an email. "You need to combine very complicated laser systems, a reaction microscope and a hydrogen atomic beam system to work all at the same time," Sang said. Their setup established three important reference points: the start of their interaction with the atom; the time that a freed electron was expected to emerge from behind a barrier; and the time when it actually appeared, Sang said in a video. The researchers used an optical timekeeping device called an attoclock — ultrashort, polarized light pulses capable of measuring electrons' movements to the attosecond, or a billionth of a billionth of a second. Their attoclock bathed hydrogen atoms in light at a rate of 1000 pulses per second, which ionized the atoms so that their electrons could escape through the barrier, the researchers reported. A reaction microscope on the other side of a barrier measured the electron's momentum when it emerged. 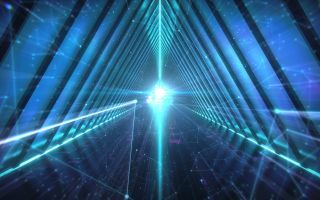 The reaction microscope detects energy levels in a charged particle after it interacts with the light pulse from the attoclock, "and from that we can infer the time it took to go through the barrier," Sang told Live Science. "The precision that we could measure this to was 1.8 attoseconds," Sang said. "We were able to conclude that the tunneling must be less than 1.8 attoseconds" — near instantly, he added. Experiments in quantum tunneling bombarded hydrogen atoms with light pulses and then measured their momentum with a microscope. Though the measuring system was complex, the atom used in the researchers' experiments was simple — atomic hydrogen, which contains just one electron. Prior experiments conducted by other researchers used atoms that contained two or more electrons, such as helium, argon and krypton, according to the study. Because freed electrons can interact with each other, those interactions can affect particles' tunneling times. That could explain why prior studies' estimates were longer than in the new study, and by tens of attoseconds, Sang explained. The simplicity of hydrogen's atomic structure allowed the researchers to calibrate their experiments with an accuracy that was out of reach in prior attempts, creating an important benchmark against which other tunneling particles can now be measured, the researchers reported. The findings were published online March 18 in the journal Nature.